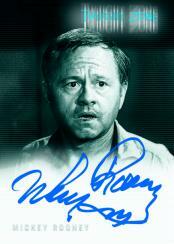 Rittenhouse Archives and www.scifihobby.com are pleased to announce the upcoming release of our Twilight Zone Series 4: Science & Superstition Trading Cards, available February 2005. This all-new series will cover the 12 classic episodes of legendary science fiction program, and each box is guaranteed to contain not 1 but 4 hand-signed autograph cards! A total of 32 different actors will be signing cards for this series including Mickey Rooney, Ron Howard, Sydney Pollack, Orson Bean, Anne Francis, Arte Johnson, James Doohan and many more top actors from the "Zone". In addition to autograph cards from so many legendary actors, there will also be an extremely limited edition series of autograph cards featuring "cut signatures" of deceased Twilight Zone creator, narrator and writer Rod Serling. These ultra-scarce cards will be inserted at the rate of 1 in every 100,000 packs. It is expected that only 3 of these cards will make their way into circulation, depending on the final production run of the series. This marks the first time that Rittenhouse will be using "cut signatures" from a deceased person as part of our marketing program. "We had the opportunity to acquire a small quantity of authentic signatures of Rod Serling, so we took advantage of it," said Rittenhouse President Steve Charendoff. "I only wish we could have found more. I believe that these rare Serling cards will generate a tremendous amount of attention in the hobby, due to their legitimate scarcity, and I can�t wait to see what happens if and when one of them is put up for sale. Of course, if die-hard collectors find these cards, then they may never be sold. We�ll just have to wait and see." Also randomly inserted into boxes of the Twilight Zone Series 4: Science & Superstition Trading Cards will be several exciting bonus sets, including 18 "The Quotable Twilight Zone" cards; 9 "Twilight Zone Stars" cards; 8 "Twilight Zone Hall of Fame" cards, each numbered to 333; and 1 checklist card. Fans will also be able to store their collections in a custom designed collector's album, which will retail for $39.99 and will contain an exclusive autograph card of Edson Stroll as Walter Smith in the classic episode "The Eye of the Beholder". Stroll�s autograph card brings the total of all of Rittenhouse�s Twilight Zone autograph cards produced to date to 97, across all 4 series, not including the rare Serling card. "My goal has always been to surpass 100 different autograph cards," said Charendoff, "and to keep going. I remain committed to that goal. We have several more people lined up for future Twilight Zone editions, but we want to find more. We strongly encourage fans to contact us if they can help locate additional actors who have not yet signed for us. The Twilight Zone is now 45 years old, and many of these actors are hard to locate, particularly the women who got married, changed their last names and left Hollywood." Rittenhouse Archives, Ltd. is a leading producer of science fiction and fantasy based trading cards and related collectables. Its licenses include Star Trek, James Bond, Xena: Warrior Princess, Stargate SG-1, Stargate Atlantis, Battlestar Galactica, Farscape, Twilight Zone, Lost In Space and Conan.